Facebook is a highly profitable way of garnering information from individuals and then selling it on to advertisers and other companies who can then target individuals. It is a highly effective way of gathering such information, far better than the methods used by PR consultants for many years. What the Cambridge Analytica uproar is about is that that that outfit got hold of the profiles of 50 million Facebook users via a psychology professor and then used the information in various political campaigns like the Trump election and Brexit. This is hardly new information but papers like the Guardian have used the so called scandal to mount attacks on social media. They do this partly due to their liberal outrage over a perceived attack on the liberal wing of capitalist democracy, but also because they regard social media as a threat to their circulation. But in this society politicians and the rich have always used the media, whether it be “traditional” media, radio, television, the press, or new media like Google and Facebook, to distort and disinform, withhold information, tell outright lies and conduct bigoted campaigns against those it sees as threats. It is the height of hypocrisy for the newspaper media to cry “manipulation” when they themselves have been involved in the manipulation of ideas and information for very many years! As for the press in general, who can forget the Sun’s lies about Hillsborough? Why else do 51% of people in Britain distrust the media, the highest percentage in Europe? There has been no uproar when other market research companies use information gathered from the Internet to apply targeted advertising. That’s business as usual as far as the press is concerned. It’s also okay to spend vast amounts at elections, as the Tories did at the last election, spending £18.6 million, which included £2 million to Facebook. The rich own the media in all its forms. They use it to maintain themselves in power. 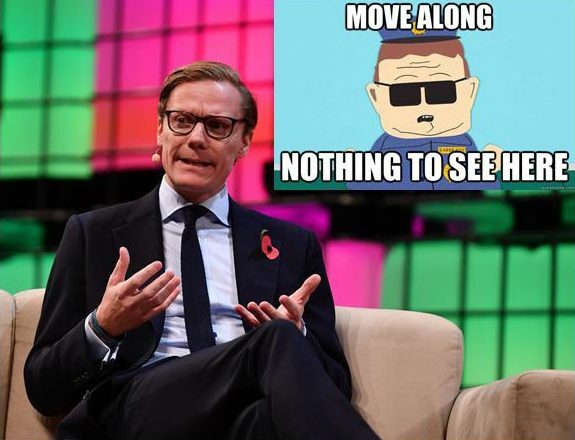 The nasty manipulation by Cambridge Analytica is nothing new. Only the fact that it is done via the Internet makes it any different. Victory for cleaners at the Daily Mail! No War But The Class War!